Society has a long way to go before a man in a dress is as acceptable as a woman in pants. In her memoir, “Dear Mom and Dad,” Georgia Lee McGowen details her life with dual genderism as a single soul reacting to the elements of two spirits -- both male and female. 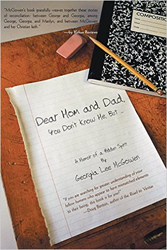 “Dear Mom and Dad” traces the life of George through the eyes of Georgia, the female half of their soul, from early childhood to present day. By sharing her story, McGowen hopes to help others struggling with their own gender identities to avoid the missteps she made in life, and encourages them to acknowledge who and what they were meant to be while applying their talents, abilities and passions to be truly happy and content. A 2014 study by the American Foundation for Suicide Prevention found that 41% of people within the gender non-conforming community have attempted suicide at some point in their lives, and that societal discrimination was often a strong contributing factor to their attempts. “Society has a long way to go before a man in a dress is as acceptable as a woman in pants,” McGowen said. For more information, visit http://georgialeemcgowen.authorsxpress.com. Georgia Lee McGowen spent 30 years in George's subconscious while they both struggled to understand the meaning of their dual nature, and another 25 years learning to live with their distinct differences. They currently reside in Mesa, Ariz.